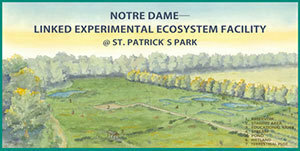 The University of Notre Dame Linked Experimental Ecosystem Facility (ND-LEEF) will host its inaugural “Science Sunday” from 1 to 4 p.m. Sept. 29 at St. Patrick’s County Park in South Bend. Scientists from Notre Dame will be on site to discuss their current research at ND-LEEF. ND-LEEF is a globally unique research site housing multiple experimental watersheds, each with a linked stream, pond and wetland system. Each watershed hosts cutting-edge ecological research in a setting that mimics nature, yet is highly controllable and replicable. ND-LEEF will be critical in solving major environmental challenges facing society by bridging the gap that has traditionally existed between the laboratory and field research. Participants in Science Sunday will learn how hydrologists study the flow of water and how aquatic ecologists study complex interactions of living organisms in the water and see science in action. There will also be hands-on exhibits for children to learn more about aquatic life and water flow. ND-LEEF is located at St. Patrick’s County Park. The entrance to ND-LEEF is off Laurel Road between the main park gate and the Park Gate House. This event is open to the public and free of charge. Complimentary light refreshments will be provided.